While much of O'Keeffe's early work from the teens is abstractions, she began to paint images of the city in the 1920s. 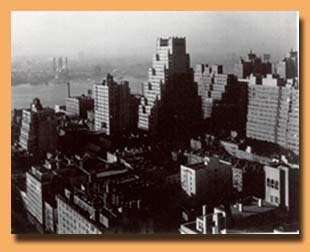 From 1926-1929 O'Keeffe produced several paintings of New York skyscrapers and cityscape scenes looking out from her apartment window on the 30th floor in the Shelton Hotel. The mystique of the skyscraper caused it to become a muse for photographers and artists like Charles Demuth and Charles Sheeler. The skyscrapers quickly came to signify "material symbols of modern technology" (Orvell 206). Europeans visiting New York in the 1920s were equally fascinated with the architectural feats. According to van Leeuwen "the appeal America exercised as the ideological reflection of anything inadmissible in ancien regime Europe" was possible because "America was free, it was unlimited in space, it abounded in natural resources and in money. It knew no tradition, it had no history" (From the Faraway Nearby 68-69). 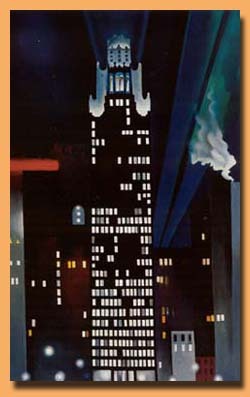 The skyscraper was a distinctly American "thing" and how it was to be represented in an accurate and aesthetically pleasing way was a challenge to photographers and painters in the New York art world. 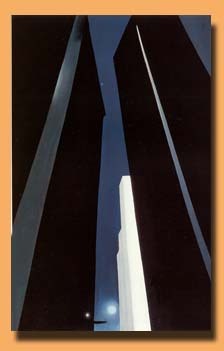 Although O'Keeffe's paintings of skyscrapers might appear simplistic, their power lies in the perspective O'Keeffe employs in her technique. Her paintings often times used the vantage point of being on the ground and looking up which conveys a sense of wonder an individual might experience while craning one's neck to look up at the awe-inspiring skyscraper. O'Keeffe said, "I began talking about trying to paint New York. Of course, I was told that it was an impossible idea-even the men hadn't done too well with it" (From the Faraway Nearby 73). Shelton with Sunspots portrays a photographic glare that is caused by not having a lens hood on the camera. 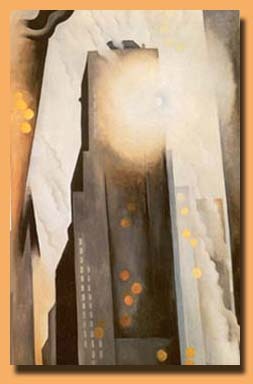 The result is a painting in which the skyscraper appears to be equated with the divine, romantic light of a deity. Not all of the skyscrapers that O'Keeffe painted portray the romanticized aesthetic seen in Shelton with Sunspots . 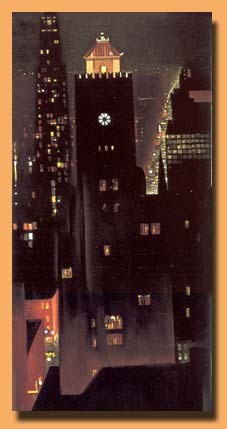 The vertical convergence seen in City Night , 1926 depicts a photographic technique that "occurred with the old view cameras when they were pointed upwards" (Peters 284). The effect of this vertical convergence creates a cavernous and forboding city image with the white light shining as a beacon of hope to those who wander the city streets. In contrast, O'Keeffe's subtle use of light in New York Night conveys a sense of warmth and life inherent in the city. Although the majority of the painting is comprised of dark buildings, the lighted windows in the skyscrapers and the lighted street area in the lower left-hand corner of the painting are suggestive of the living beings who breathe life into the city on a daily basis. Georgia O'Keeffe's cityscapes bear resemblance to Stieglitz's panoramic photographs of East River. O'Keeffe's decision to cease painting the New York scenes coincides with the stock market crash of 1929. Her paintings that once captured the magnificence of the skyscrapers and rendered them as symbols of the success and strength of American capitalism became reminders of the failure of businesses. O'Keeffe's own disillusionment with city life and with her personal relationship with Stieglitz encouraged her to accept an offer from Mabel Dodge Luhan to spend the summer of 1929 in Taos, NM on Luhan's ranch. Here she drew inspiration from the vast landscape and began to paint images of animal bones.